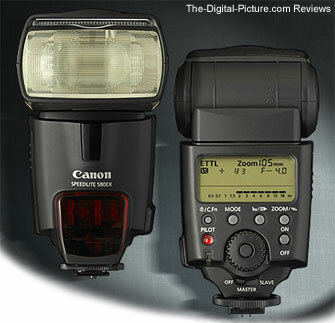 Note: The Canon Speedlite 580EX Flash has been replaced by the Canon Speedlite 580EX II Flash. The Canon Speedlite 580EX Flash contains a superset of the features found in the Canon Speedlite 550EX E-TTL Flash in a smaller, lighter and more modern designed housing. Canon's Press Release contains lots of good information (recommended reading) about the new features in the 580EX, so I will focus primarily on my perception of this flash. And I'll cut the chase. For most of us, the question that matters far above all others is - how does the 580EX coupled with an E-TTL II Digital SLR body perform? As in how does it handle exposure? I'm sure I didn't encounter every possible flash situation, but from my observations, the 580EX is not significantly better than the 550EX for exposure control. In some situations, my 580EX gave me a slightly better result than the 550EX. But, more frequently the two gave me similar performance. Similar exposure performance is not bad. The Canon Speedlite 550EX Flash exposes very well. What is very important is that the person behind the viewfinder knows how Canon's E-TTL works. I included a link to an excellent article at the end of this review. It will launch your E-TTL knowledge. The photographer's knowledge will make a much more dramatic difference in end results than the selection of a 580EX instead of a 550EX. Overall, I am very pleased with the Canon Speedlite 580EX Flash. I have upgraded all of my Canon Speedlite 550EX Flashes to 580EX Flashes - the price has settled down somewhat and the gray market versions are available. Out of the box, the 580EX did not look much smaller than the Canon 550EX Flash. But after using two flashes for awhile, the 580EX feels noticeably smaller. While the Canon 550EX is block-shaped, the 580EX is much more rounded. It is a more modern design - and looks better (if that is important to you). It is easier to grasp and hold (although most of the time it is simply mounted for use). The vertical base of the 580EX is narrower than the 550EX. The 580EX's slightly lighter weight (compared to the 550EX) is very welcome at the end of a long hot-shoe or bracket-mounted flash shoot. Batteries go into the 580EX in a 2x2 configuration - similar to the Canon 420EX Flash but different from the Canon 550EX Flash's 4x1 pattern. Opening the battery door is more of a chore than it should be, but it is nothing more than a minor annoyance. Move the Canon Speedlite 580EX Flash's power switch to on and the flash is on - nearly instantly. The 580EX shows the ready light much faster than the 550EX. Recycle time is also reduced. Canon lists .1 to 6 seconds as the time to ready depending on flash power used. The 580EX also goes into sleep mode automatically after 90 seconds of no use (there is no SE - Save Energy power-on mode as with the 550EX). A touch of the shutter button brings the 580 back to life. Like the 550EX, the 580EX's pull-out and flip-down diffuser panel supports lenses down to 14mm. The field of view crop factor is included in this spec. This means that the Canon EF-S 10-22mm USM Lens is supported on EF-S compatible Canon bodies. Immediately above the diffuser panel is a white, semi-rigid piece of white plastic (a catchlight reflector) that pulls straight out (or up?). Use it for creating a catchlight (a bright sparkle) in your subject's eyes when using your Canon Speedlite 580EX Flash in vertical bounce position. A single button releases both the tilt and rotate locks on the 580EX (two separate buttons are required to adjust the 550EX). A single grip/button press allows the flash head to be rotated and tilted at the same time. Rotation is up to 180 degrees in both directions. The single button release is a really nice enhancement. Another very nice enhancement is the control dial and set button. It is much easier and faster to change settings using the control dial and set button on the Canon Speedlite 580EX Flash than with the hard-to-press +/- buttons on the 550EX. The power on switch has only one setting and is easier to use. The Off/Master/Slave switch is also much easier to use. A high speed flash synch button makes this setting easer to change. Don't forget manual mode. Using the control dial, it is now easier and faster to set manual flash power output. If your subject distance is consistent (formal portraits for example), a manual flash output setting can eliminate shot-to-shot exposure variations. Manual flash output can now be controlled in 1/3 stop increments. Canon's Speedlite Flashes include an AF-Assist Beam to enhance autofocus performance in low light conditions (see the red window on the front of the flashes?). The 580EX's AF-Assist Beam is aligned with the focus points on all of Canon's EOS bodies (when using 28mm or longer focal length lenses according to the manual). You get enhanced AF performance on all EOS bodies in (or coming to) your collection. 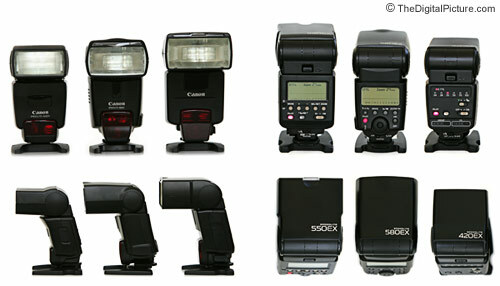 The Canon Speedlite 580EX Flash can control (master) and be controlled by (slave) the Canon Speedlite 550EX Flash and the Canon ST-E2 Wireless Transmitter. The Canon 420EX Flash can be slaved as well. Canon Speedlites use light - not RF - for simple but useful wireless flash communications. The 580EX provides a bit more power than Canon Speedlite 550EX Flash,but it is not enough extra to be a big differentiator for most people. The 580EX's maximum guide number is 58 (105mm, ISO 100 in meters) vs. the 550EX's 55. Battery life in the Canon Speedlite 580EX Flash should be longer than with the 550EX when using a FOV (Field of View) crop Digital SLR body (see the press release). Improved electronics should account for some additional battery life as well. I honestly can't say I have tested this feature as the Canon 580EX is rated for 100-700 shots depending on power use while using Alkaline batteries. Like the Canon Speedlite 550EX Flash, the 580EX includes FEC (Flash Exposure Compensation) in its large feature set. Canon EOS 300D Digital Rebel owners should take note as this Digital SLR body does not have FEC built into the camera. The 580EX will add a great feature to your setup. A somewhat unimportant improvement is the new shoe stand that comes with the 580EX. It is a nicer/more modern design/molding and has better reinforcement at the thread insert. This won't be a differentiating factor for anyone - but it is a nice change. Be sure to have the latest firmware loaded on your Digital SLR (the Canon EOS-1D Mark II should be at release 1.0.3 or higher) to get the best results with the Canon Speedlite 580EX Flash. Firmware can be downloaded from the support area of Canon's web site. The Sto-Fem Omni-Bounce Diffuser for the Canon 550EX fits the 580EX, but not snugly. It will work until you are able to get a properly molded Omni-Bounce. I want to again stress the importance of learning how to use Canon's E-TTL Flash system. The PhotoNotes.net link in the "More Information" section below will get you well on your way to great flash photography results. The Canon Speedlite 580EX Flash is the finest general purpose flash Canon currently makes and my first choice for Canon flash photography. It delivers slightly improved performance in a much improved package. As always, you must determine if the new and improved features make the 580EX worth the price to you.